Abdissa "Mamba" Assefa (b. 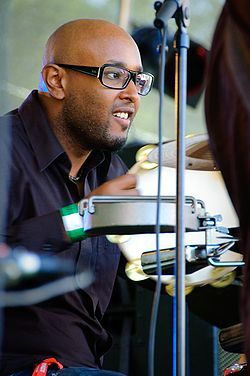 1973) is one of the most popular percussionists in the field of Finnish jazz and popular music. Assefa started to play drums at the age of 11, and got in the Pop & Jazz Conservatory when he was only 15 years old. Having graduated from the conservatory, he travelled to Gambia, whose local music with its djembe drums and polyrhytmics made a strong impression on the young musician.